Hope everyone out there had a good and safe Christmas this past weekend. This is the second Christmas we’ve had since moving back to Florida and also the second time we didn’t make the drive back to Texas. With all the expenses on fixing the Sequoia this year, we felt it best not to spend additional money driving back to Texas this year. Hopefully, we will be able to make it back next year. On Christmas Eve, we went to an early church service and then headed home for some dinner. After dinner, the opening of presents began. 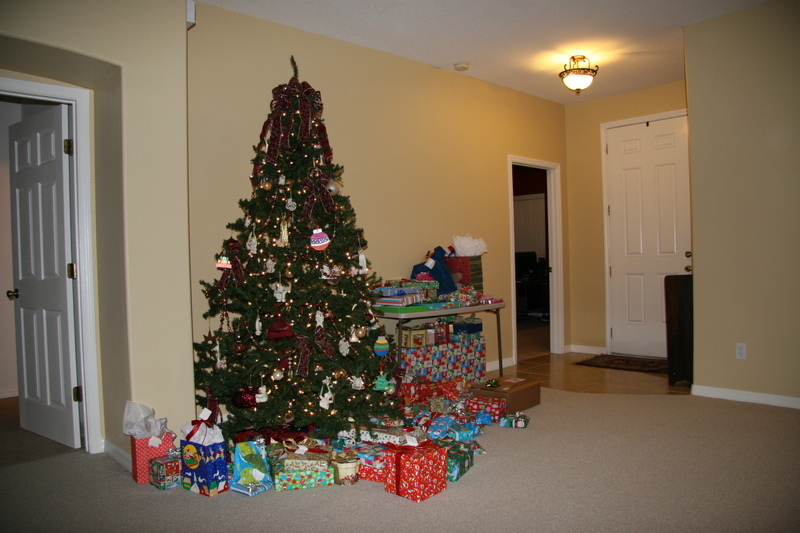 Our tree was overflowing with all the gifts from both of our families, mostly for the girls. I screwed up and actually bought Jennifer a James Avery necklace charm that I had bought her before. Oh well, I guess I had good taste twice. Izzy’s favorite toy was her Dancing Mickey and all the Littlest Pet Shop toys she got. Abby’s favorite was her iPod Shuffle. She had me putting songs on it right once we were done opening presents. Emily’s favorite present was a ZuZu Pet, but it pales in comparison to the real guinea pigs that she received from Santa. Besides the guinea pigs, now named Oreo and Nibbles, the girls received new bikes and video games for their Wii and DS. Thanks to everyone who sent gifts and thought of us on this holiday. We are blessed to have such great friends and family. Merry Christmas from the French Family and hope you have a great 2011. During the Fall Abby has been taking Chorus as an after-school activity. This all culminated in a Holiday program. Abby did a great job and is looking forward to continuing it in the Spring. You can see one of the songs to the right with the rest on our YouTube channel. On Wednesday, nearly the entire 5th floor of Electronic-Arts Tiburon got a request for a “Mandatory Madden Team Meeting”. Working on a Central Team is tough. You never know if you are supposed to be invited to team meetings or not. So, I went by the new Executive Producer of Madden, Phil Frazier’s office to find out if his meeting was intended for Central Gameplay as well. He said that it was and that I needed to make sure that some of the guys on the team showed up. He said that the meeting was actually going to be a nice catered lunch with a silly awards show. He said that there was going to be a band there, but who the band was a surprise and that there was going to be no way I could guess who it was. He was right. When I got back to my desk, I already had several e-mails asking if we were included. One person in particular wasn’t looking forward to sitting through a two-hour meeting and was asking if he could skip it. It just so happened he was going to be receiving one of the awards, so I insisted that he show up. When we showed up on Friday, the line was long to get into the big conference room on the first floor. The room was packed. About one quarter of the room was sectioned off with black paper. Phil let us eat for a bit and then he gave an introduction for our entertainment for the afternoon. He started off by saying, “How many of you remember a pizza place called Showbiz Pizza?” He then introduced The Rock-afire Explosion, the animatronic band from the pizza place of all of our youth. However, this wasn’t just some old recording, they had gone and recorded the award show so that the robots were giving away the awards. It was impressive that they spent so much time figuring out how to program the robots and set it up for the award show. It’s an event that I won’t soon forget. But, just in case, thanks to Ian Cummings for capturing video.